The process of buying a car has changed drastically over the last few years – most significantly, self-educated customers have made a decision long before they enter a physical dealership, minimizing the influence of the sales staff. Most purchases (as much as 70%) being with research conducted on a search engine, and most car buyers will consult no less than 7 sources before coming to a decision. There are also other influencing factors to contend with. According to Nielsen, 60% of shoppers consult peer reviews before making a purchase, and 59% of people consult friends and family for purchasing decisions. Car buyers are based online – where are the sellers? Car buyers have consistently used the Internet throughout the buying process, preferring to kick tyres online rather in the local dealership. 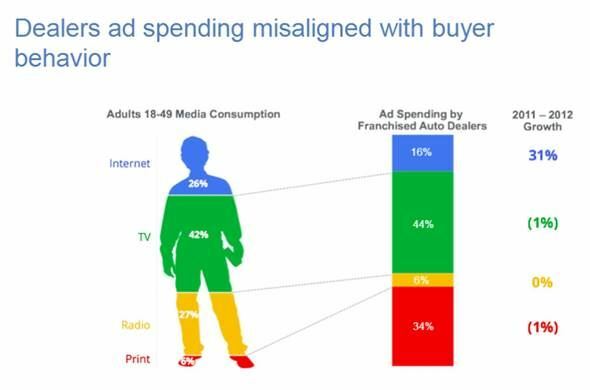 However, examining the ad spend of the average automotive company, and you’ll quickly find that the biggest portion of advertising funds are spent on print (34%), radio (6%) and even television (44%). It’s not that these are bad avenues to pursue. They are important and they are very effective when it comes to raising awareness. But the buyers are online. The new generation of car buyers – the millennials – are virtually unreachable on channels other than the Internet. 94% of them will consult online sources before making a purchase, and 23% of them will talk about their purchase on social media after the fact. The game has changed. The ones who feel this most keenly are the ones who have to move stock – the salespeople on the ground. They are also the ones who have often bypassed management and uploaded ads to online classifieds like Gumtree to generate their leads. I’ve often said it’s no longer about having feet through the door, but about eyeballs on the site. Adapting to a new model can be difficult – and most dealer principals are more comfortable seeing an ad in their local newspaper than online, knowing that it’s going to individuals that probably have seen the dealership on their commute or know them well. Television is still seen as the most desired medium, and as most radio listeners tune in during their drive to work, it seems like obvious choice for dealerships. However, all of these media have a simple flaw - one-way communication. Unlike a mobile or desktop browser, there is no immediacy. Information is broadcast at someone, not exchanged with them. The person seeing the ad in the newspaper has to put it down to communicate with the dealership, the radio listener can’t express interest with the click of a button. The Internet allows for rapid lead generation and exchange of information – feedback, questions, replies – between the prospective buyer and the salesperson. In short, it immediately allows the seller to exert his or her influence. Digital is of course, much harder to master. Search engine marketing in a competitive market is expensive, and online display ads can run five to ten times the cost-per-visit in comparison. Building a successful, high-traffic site can also take years (and millions). As a result, most dealerships have turned to third party partnerships with online car sales platforms. It’s an easy solution – but not an ideal solution. Through partnering with these platforms, dealerships are meeting their sales’ goals, but not optimally. The car industry experiences natural but often drastic peaks and troughs, and are constantly innovating in terms of their offering. Most car platforms do not cater to that – often locking their customers into long-term, inflexible contracts that charge the same fixed monthly fee, regardless of seasonality. Moreover, these sites do little other than provide ad space…analytics, lead response evaluation and even changes to stock or the addition of promotional offers have to be added by the platform’s developers, and dealerships find themselves at the mercy of a third party’s capacity and cooperation. Leads are provided, but the power to influence them is taken from their hands. Having devoted months to developing a system balancing a system that meets the needs of dealerships (but considering the flexibility of those needs) has been eye-opening – it has also revealed that those aren’t the only two elements at play in the autos industry. Consumers are still interested in their local dealerships – but they spend their time online researching what cars the dealership have in stock before visiting. It’s crucial that their ads are up to date. Stock also has to reflect in real-time. The “consideration period” before purchase has extended from 1-2 weeks, to 2-4 weeks, which can lead to frustration if stock doesn’t reflect accurately. Cognitive fluency is a necessity dictated by the Internet age. We tend to complete purchases more quickly and more often if it’s easy to find and read. Research has shown that reading information written in a difficult-to-read font, they associate the difficulty with the information, and tend to click away. Information has to be given quickly and easily. Dealerships have to examine all their options if they hope to succeed. It is possibly to reduce ad spend on traditional mediums (as well as traditional car platforms) and still increase the amount and quality of leads received. I can’t claim to have found all the answers, but asking the right questions has paved the way forward.